- A teacher's lesson plan about Floyd Bennett Field in WW2 has been published. - An interpretive brochure on Floyd Bennett Field in WW2 has been published. - An interpretive / commemorative plaque was placed in the west lobby of the Ryan Visitor Center. (See NEWS ARCHIVE page). (The Ryan Center is closed for renovation and we ask that the Park Service restore the plaque to its former location in the front lobby). - Gateway NRAs Program and Activity Guide published an article. [See NEWS ARCHIVE page]. What's next? We ask the Park Service to develop materials that support interpretation of the Field's naval aviation heritage, in harmony with the parks other stories. This includes maps, displays, signs, web sites, tour programs, and other forms of visitor contact. We're seeking the aid of experts and scholars to help the Park Service present information accurately, completely and in the proper context. The Park seeks photos, documents, logbooks, and artifacts from Floyd Bennett Field during World War II. We encourage Floyd Bennett Field veterans, civilian workers and their families to consider donating appropriate items to the National Park Service. Gateway National Recreation Area maintains an archive at Fort Wadsworth, under the care of a professional curatorial staff. These items are needed to document the story, and form the basis for future exhibits and museum displays. We're seeking support for dedicated permanent exhibit space to tell the story of Floyd Bennett Field's military aviation heritage, and to collect, curate and allow supervised access to reminiscences, ephemera and scholarship on which the exhibits would be based. We're also seeking private funds to restore the historic 1939 WPA mural sized portrait of famed naval aviator Floyd Bennett, for whom the Field is named. The Park Service has pledged to hang it in its original location inside the Ryan Visitor Center (historic control tower and administration building) when the Ryan Center has been suitably renovated for safe public access. The New York State Historic Preservation Office has agreed that the Field is of national, not just local significance. This enables the Park Service to revise their planning process for visitor interpretation and historic preservation. We ask that park staff to complete a revision of the 1980 Floyd Bennett Field National Register District - expanding the district's period of significance to include WW2 and possibly the Korean War, and expanding the district's boundaries to include historic WW2 Naval and Coast Guard buildings. This will allow planning for a much-needed military history interpretive program and historic preservation. We ask that the Park Service's Comprehensive Interpretive Plan (CIP) and General Management Plan (GMP) be updated to include interpretation of the field’s period as Naval Air Station New York (1941-1972). The Task Force placed a privately funded plaque recognizing naval aviators who died on duty while stationed at Floyd Bennett Field. The plaque is located in the west lobby of the Ryan Visitor Center. [See NEWS ARCHIVE page]. (The Ryan Center is closed for renovation and we ask that the Park Service restore the plaque to its former location in the front lobby). 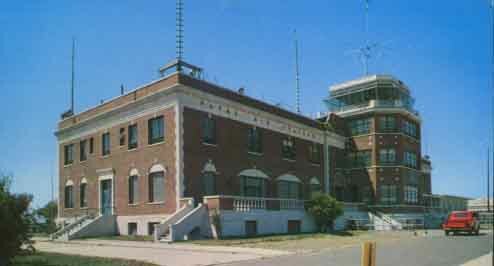 The National Park Service has lost by demolition historic WW2 era naval buildings and structures, including the BOQ (Bachelor Officers Quarters), Officer's Club (the interior furnished with fixtures from the French liner Normandie), and Hanger's 9 and 10 - base for the Naval Air Ferry Command. We seek preservation and appropriate economically sustainable reuse of remaining historic WW2 naval aviation buildings (including the Administration Building, and Hangar B) and structures such as runways. Appropriate adaptive reuse of these badly deteriorated historic buildings should include telling the story of how these buildings originally served the mission of the Field.